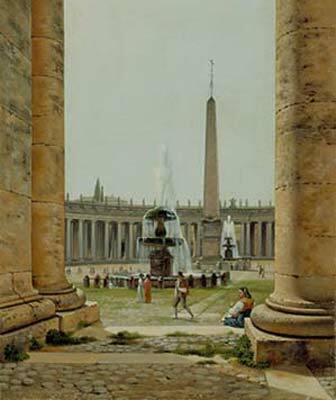 In the picture of St. Peter’s Square, Eckersberg has more or less ignored the two natural main motifs in the area in front of St. Peter’s: he shows us neither the imposing church facade with the famous dome nor the striking colonnades of the square in their full length. Eckersberg has looked more at the possibilities for perspective construction offered by the transverse axis of the square. The foreground’s colossal columns – rendered in minute detail – precisely underline the distance between foreground and background, while the fountains, the figures and the obelisk mark out the inward-leading lines of the perspective. It is a framed view with a tightly structured space where the emphasis has been given to the specially selected angle and the potential it offers. As observers we are made aware, manipulated – very discreetly – into seeing the surroundings from a different angle than the usual one. Eckersberg’s painting is generally characterized by a convincing exploratory use of the possibilities of perspective. In addition he is radical in choosing neglected sections of the surroundings as his main motifs. Issues of perspective had come to interest Eckersberg during a study period in Paris. Later, when he went to Rome, he cultivated this interest more intensely in a series of views of the well-known sights of the city. Ordrupgaard’s picture is an example of such a view.